Originally serialized as a Manga in Shonen Jump, Super Batoman is currently being converting into a TV series set to run for 52 episodes. Along with his trusty side-kick Lobin, Batoman fights crime and saves Gohan city from evil aliens and giant robots. 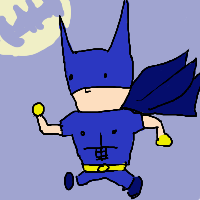 Dun nun nun nun nun nun nun BATOMAN! Dang, this should be showcase. He has two faces!